Composed for late nights alone in a crowd, on an unlit highway or lost in one's own mind, Kevin Greenspon blends lush ambient sound design, aquatic dub techno and atmospheric house to sculpt a surreal world vaguely resembling the empty concrete courtyards of our own cities. An exploration into the space between emotions, "Mood Recovery" consists of cascading ribbons of tape hiss wrapped into static while seismic sub frequencies ripple deep under clattering scrapyard rhythms and gritty echoes. Throughout the journey, a contemplative shadow is cast over each moody arrangement, climaxing in a frantic rush to escape the dark. 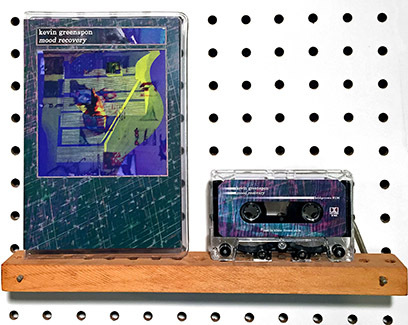 Edition of 99 cassettes dubbed in real-time with full-color labels and doublesided printing on heavyweight gloss stock in deluxe oversized cases, includes digital download + an edition of 60 stamped CDrs in full-color sleeves.